Last Saturday brought my very first regatta with Clevedon Pilot Gig Club. And so it was that I found myself at six o’clock in the morning, standing forlornly at the side of the road next to the parked-up gig*, hoping desperately that I’d got the right day, time and place to meet up with my fellow rowers. Thankfully, I had. And we were soon in the car, gig in tow, heading south west. 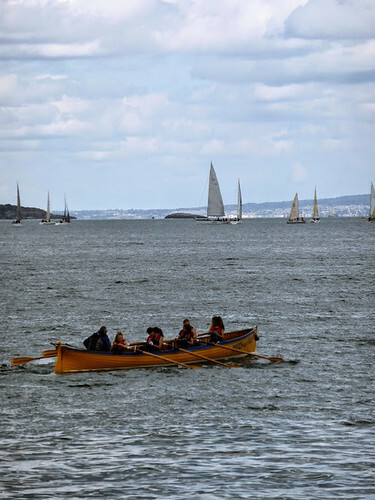 Our destination was Brixham, where the local gig club was holding its inaugural regatta. Other than the host club, we were the first giggers there, so we got the boat in the water and rowed her** around to the beach where the event was taking place. As we pootled across the harbour, the early morning sunshine infusing the town with a rosy glow, I started to wonder (and not for the first time, to be honest) why I don’t live there. As the other gigs, rowers and supporters arrived, the locals also started to wake up, and soon the bay was humming with activity. Swimmers, sailors, powerboaters, fisherman and jetskiers gradually brought the place to life. And once the racing got under way, the seven gigs set out to join the fray. The course was a 2,000 metre kite-shaped affair, with the gigs starting close to the shore and heading quickly out to sea. The first mark was out of sight around the headland, but the gigs soon came back into view on their way to the distant second and third marks. The final leg was the longest and most tense, as the crews put on a final burst of speed and raced for the line. Here’s my crew, I’m the one at the front in the hat. While it’s clear that I have a fair bit of work to do before I’ll be a proper gigger, it was great to be back out on the sea again. As someone from a seafaring family who was brought up in small sailing boats, graduating slowly to larger and faster sailing boats (and some extremely fast motor boats), it’s a constant source of regret that I don’t spend more time out on the water. But it seems that I may still have salt water in my veins, as since I got back from Brixham I haven’t been able to stop thinking about the water, the waves, the cameraderie and the salt air. The five miles between where I live now and the coast at Clevedon have never seemed so far. So before I turn into a complete landlubber, perhaps it’s time to get back on the water again. * A pilot gig is a 32-wooden boat, powered by six rowers. They used to take pilots (local sailors who knew the waters well) out to incoming ships, hence the name. Now they’re used almost exclusively for racing. Don’t say you never learn anything new here. ** For readers not coming from a nautical tradition, boats are female and so are always referred to as ‘she’. Even the really ugly ones that have all of the grace and poise of a beached whale. It’s just the way it is. A big thank you to my fellow gigger, Steve Cox, for kind permission to use some of his photographs from the day. And a big thank you to Brixham Gig Club for such great hospitality, organisation and enthusiasm (and cakes). 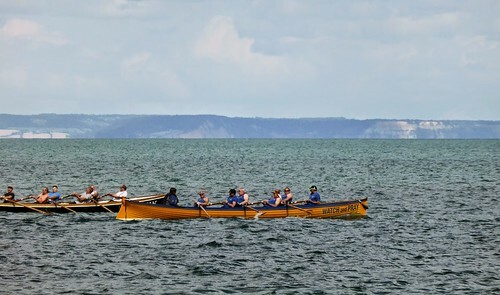 This entry was posted in Life, Outdoors, Travel, Watersports and tagged Brixham Gig Club, Clevedon Pilot Gig Club, Gig racing by Simon Perks. Bookmark the permalink.